It’s not a stretch of the imagination to say that Sean Patton is one of the funniest working comics in the country. For years, this man has been making the world bust a gut with his one-of-a-kind act which celebrates the goofiness of existence and the absurdity of life itself. Patton’s one of the most respected and gifted comics in the game, and the blend of off-the-cuff silliness and world class storytelling at any Sean Patton show is awesome to behold. He’s making his return to The Plus in Eau Claire this week for a Clear Water Comedy show on Wednesday Nov. 28 for the fourth time in four years. Something about our community and our audiences is a no-brainer for him, and in his last three local shows he’s left the stage to standing ovations. That’s pretty cool. And Patton’s consistent presence is something of a legitimizer for our independent small city comedy scene. 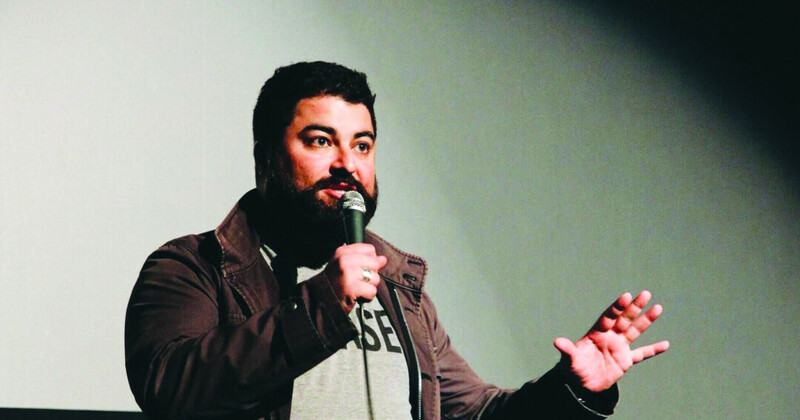 “If you’re in the audience he’s the kind of funny where you laugh until your ribs hurt and your face stings from grinning for an hour straight,” says Jordan James of Clear Water Comedy. “And if you’re a comedian he’s the kind of funny that makes you want to quit comedy because you know you will never ever ever be as funny as Sean.” We recently caught up with Patton following his first ever tour of Asia to talk about his upcoming EC show, his comedy philosophy, and why people need laughter. Volume One: So, how’s your year going? I saw you just got back from touring all over Asia. How are you feeling about those shows? Have you done that before? Sean Patton: It was my first time to Asia. I performed in Hong Kong, Chengdu, Beijing, Singapore, and Kuala Lumpur. There's a budding comedy scene over there, all English speaking. It was a really cool experience. Those places are all very different, yet very similar to us in ways I don't want to put in print. (J/K! Sorta...) I highly recommend going if you ever get the chance. I believe this will be your fourth Eau Claire show, and no pressure, but it’s a pretty big deal to us out here in a small city like this! For real. I’m curious, what keeps you coming back? What do you find special about shows here? Eau Claire is just a magical hamlet. It makes me feel like small town USA is having a renaissance and we need that to happen. It's also beautiful, friendly, yet f*cking crazy! Great comedy audiences all around. What I love about seeing you do your thing is how loose it can feel, but then at the same time there’s some very high-level storytelling happening. It’s always an adventure. How did you develop that style? I really had no plan, except writing and performing as much as possible – and outdoing myself with every set. And I love this, so my style just developed itself. At a certain point, my style developed me. Seems like more recently your on-stage stuff has a more personal feel to it. By letting audiences in on a little of that vulnerability, how does that help them connect to the material? I've always been about celebrating the beauty of human flaw, because it is the one thing that unites all people. Maybe a weird, big question: Why do you think people need comedy? Laughter is the most important human reaction. It can cure. I believe that. Laughter helps you enjoy, cope, understand, sympathize, empathize, inspire, and be alive. We all need to be alive to truly live. You seem to always have stuff going on between tours and TV and whatnot. I think last time you were in town you were prepping your first hour special, if I’m remembering right. What are you working on next? Any exciting projects you can talk about? I am always working on something. We all are. And should all always be. 100% pure Sean Patton onstage. Go and see Caitlin Cook the night before on Nov. 27 at The Plus. She's doing a one person show. It's comedy, music, and visual art. She's preparing for the Edinburgh Fringe in 2019. I've seen this show and it is wonderful! Tickets to see Sean Patton live at The Plus in Eau Claire on Nov. 28 are $10 in advance and $15 at the show. You can buy tickets at volumeonetickets.org.